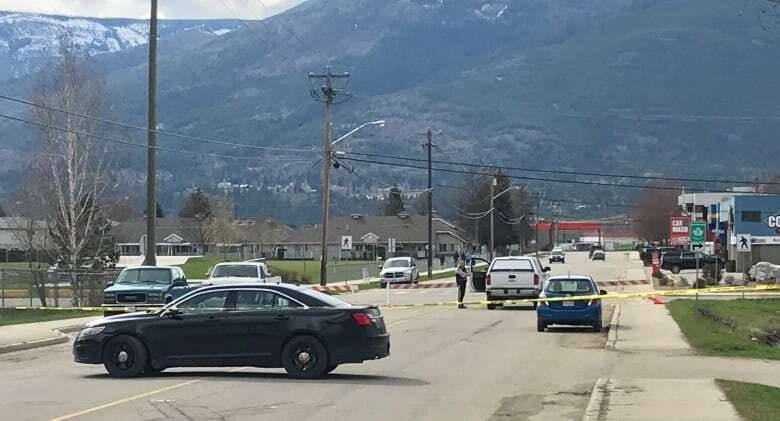 One man is dead, another person is in hospital and a suspect*is in police custody*after a shooting at a small church in Salmon Arm, B.C., on Sunday. Family members have confirmed that the deceased is Gordon Parmenter, an elder at the*Salmon Arm Church of Christ. Police say the shooting was not religiously motivated. Police and B.C. Emergency Health Services said*they received calls around*10:30 a.m. PT about two people who had been injured*at the church. One of the injured was airlifted to hospital, and is in stable condition, said Salmon Arm RCMP. Mounties said*a 25-year-old man was taken into custody after being wrestled to the ground by a number of the parishioners. A rifle was seized. Police said*there is no active or ongoing threat to the public. "Police have determined that at least one of the victims was known to the suspect, and it is not believed at this time the event was religiously motivated,"*said Staff Sgt. *Scott West, the Salmon Arm RCMP detachment commander. Mark Parmenter, the grandson of Gordon Parmenter, said*the family knows the person who allegedly shot the elder Parmenter. He also told CBC News that his grandparent's home was burned in a suspicious fire in March. Police have not said if the two incidents are related. The Parementers*have been described by people who know them as a large and religious family. Gordon Parmenter and his wife Peggy were also foster parents. "Our hearts are broken, we feel so blessed to have the faith that we have," it*said. "It gives us the strength to love and forgive in any situation. We are praying for all the families affected." Her daughter who spoke to CBC News said*the congregation is made up of 50 members or less and is a nondenominational Christian church. It issued tax receipts for gifts totaling*$45,595 in the 2018 tax year.